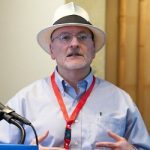 Bio: Joseph is RStudio’s “Ambassador at Large” for all things R, editor of the R Views blog, and RStudio’s representative on the R Consortium’s board of directors. Joseph came to RStudio via Revolution Analytics and Microsoft where he was a data scientist, blogger and community manager. Joseph began his engagement with R as a graduate student in 2004 and deepened his appreciation for the language working as a statistician for a small healthcare economics firm. Previously, Joseph held a variety of technical, marketing and sales positions while working for technology startups that spanned multiple industries including government contracting, local area networks, disk drives and test equipment. Joseph studied Classics and Mathematics as an undergraduate at Franklin & Marshall College and earned an M.A. in Humanities and an M.S. in Statistics from the California State University. Joseph’s main blogging interest is to tell the story of R and the vibrant, world-wide community that makes R happen.